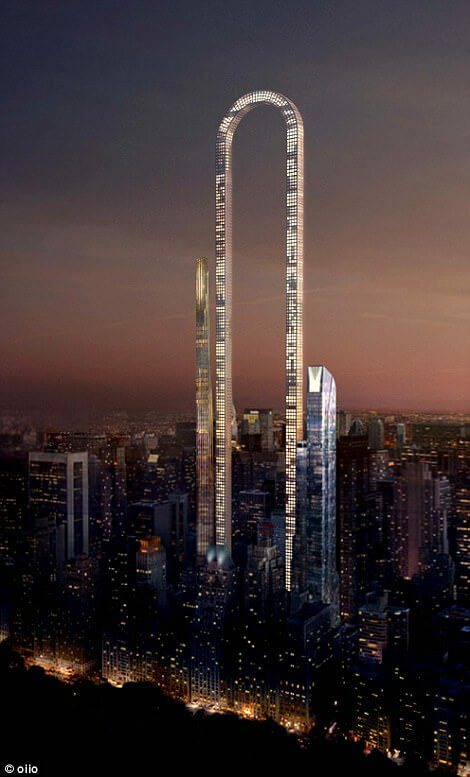 Every few years we hear about a new skyscraper that will be the tallest in the world, now the race to build the most spectacular building in the world took a weird turn. 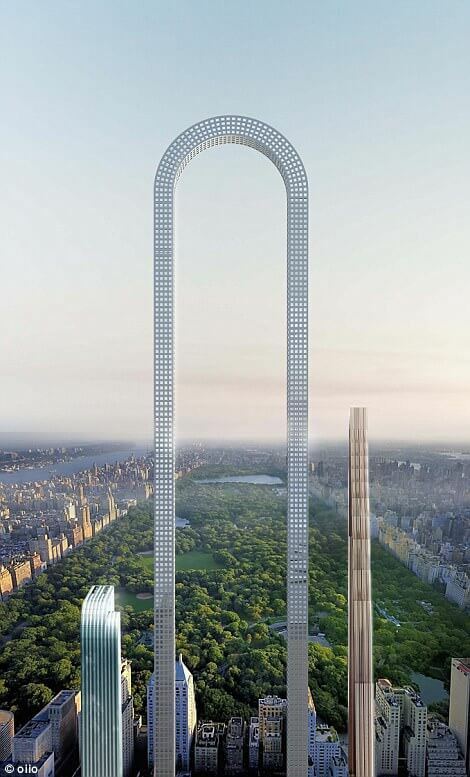 Recently released are the plans and designs for ” The Big Bend “, a huge tower that would change Manhattan’s skyline. 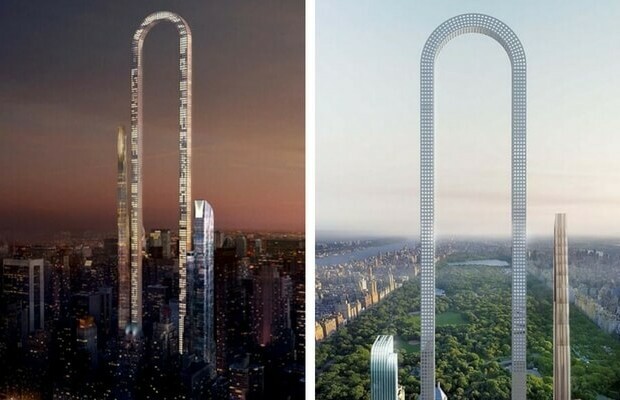 It is said that it will be the longest building in the world and as you can see from the sketches , the skyscraper will reach an apex and will curve back down, it will also feature elevators that could travel in curves and loops, AMAZING! The elevators in the building will travel in curves creating a complete loop. The track changing shaft allows the elevators to travel horizontally and vertically. 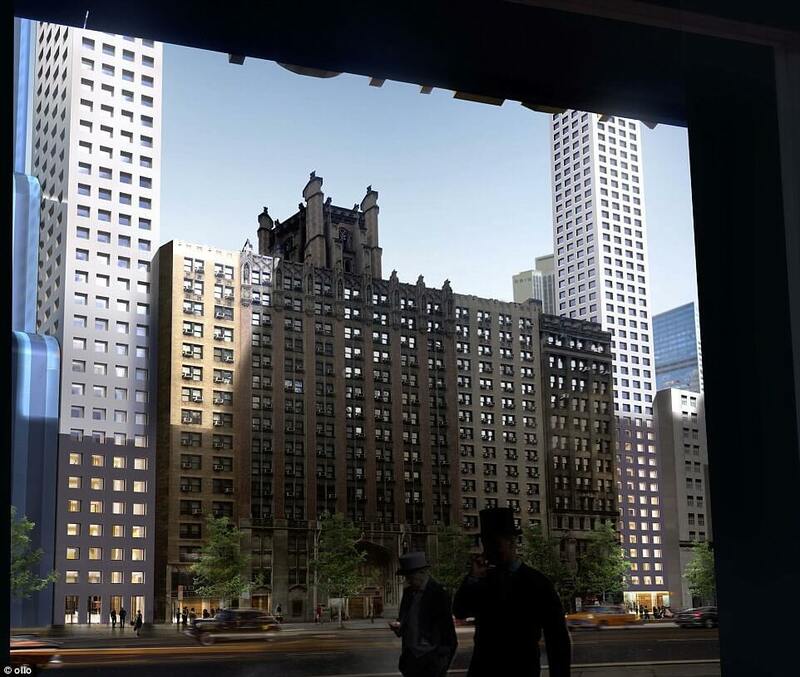 In Spite of the challenges New York’s zoning laws set, the design studio Oiio has designed a cool and innovative concept to cater to the Billionaire’s street at 57th. 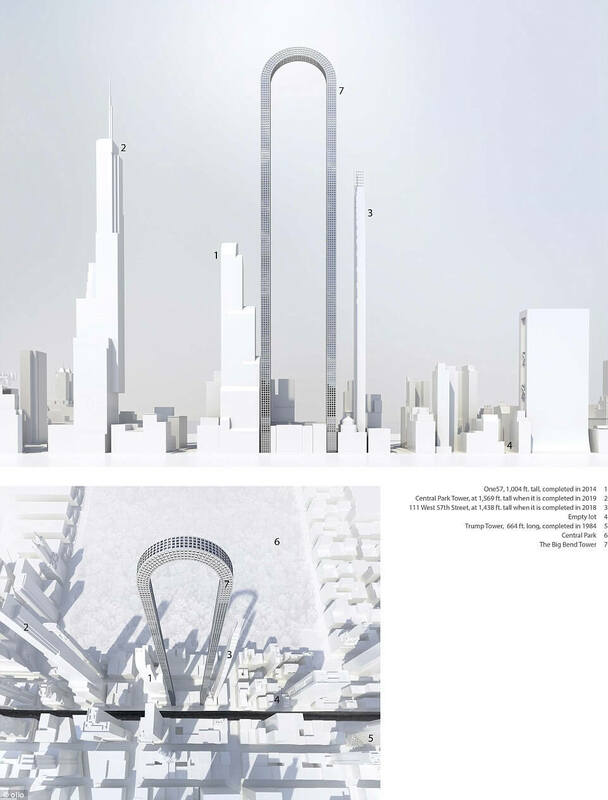 Oiio studio explained their thinking as such ” New York city’s zoning laws have created a peculiar set of tricks through which developers try to maximise their property’s height in order to infuse it with the prestige of a high rise structure. 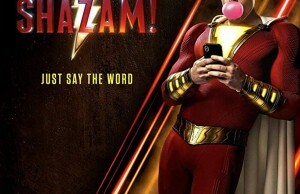 But what if we substituted height with length? 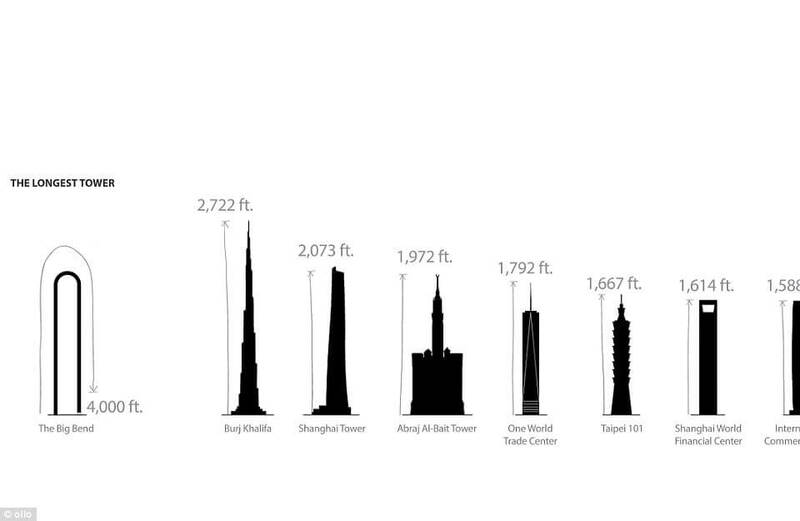 What if our buildings were long instead of tall? 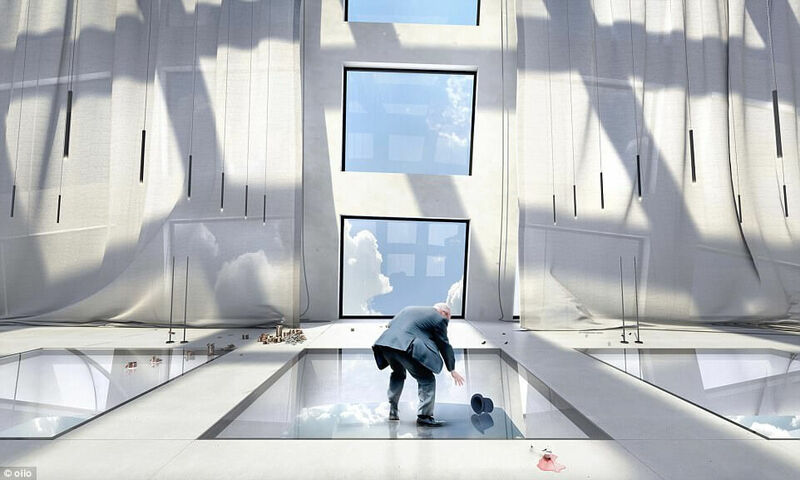 The bent building will be 4,000ft long and feature all glass windows, because of the innovative design the team needed to design an elevator system that could do things that no other elevators did before. Their innovative design of the elevator system will allow a track changing for horizontal and vertical shafts on the top and bottom to create a continuous loop. The Big Bend will be the longest building in the world and if it will be stretched out it will be the tallest building in the world too. The team at Oiio said that The Big Bend design was a modest idea to the limitations of New York zoning laws. Ever since One57 has emerged on the street in 2014, everything changed in regards of designing buildings. The team at Oiio explained. Ever since that design of the super building, the company has seen a major spike in sales and a new trend seeking skinny skyscrapers and super-slenders. We are all pretty used to the fact that the tallest buildings are expensive, every time we hear about a new building that could be the tallest building in the world, everyone is impressed and it seems that height is an equivalent of expensive. With The Big Bend the team could build a structure that will truly stand out from the crowd but still within the zoning rules of New York city. And isn’t that what innovative architectural design is all about?